Is it possible? Can anyone atone for sins and receive forgiveness without the shedding of pure blood? Leviticus 17:11 is only one verse out of many that explains how it works: a pure and sinless soul (blood) has to be poured for a sinful soul to be covered. With the destruction of the Second Temple (70 AD), the sacrificial system was destroyed as well. So how can a practicing Jew stand before God without shedding of blood? Many ideas developed through the ages, to provide for this lack. 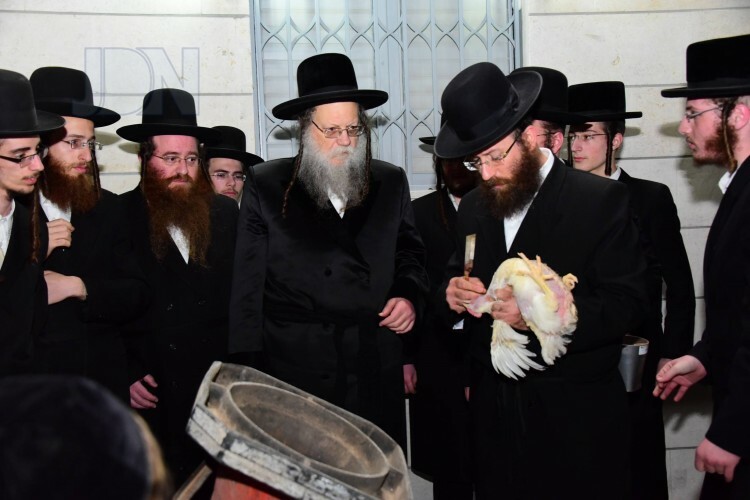 One of them is the sacrifice of roosters – a practice that can be seen in many places around Israel as the Holiest Day of the year is about to launch, the Day of Atonement. This is my exchange, this is my substitute, this is my atonement. This rooster will go to its death, while I will enter and proceed to a good long life and to peace. Than they slaughter the rooster and give it to the poor. Many Jews despise this practice and replace the chicken with money. They circle coins over their heads and say a similar prayer. The point remains: a whole nation is faced with a severe fact. We are sinful, we need to draw near to God, but we can’t do it without a price. As this Holy Day approaches (in just a few hours), I invite you to pray for a People that sit in darkness, that understand intuitively some spiritual important principles, but come up with men-made solutions that only add to our sinfulness. Many in our nation will spend the next 25 hours in synagogues, looking for some relief for their enormous guilt, hoping to turn a new page with God, not knowing He had already provided – a Lamb! Not a rooster. Not knowing the price has already been paid. Fully, completely! Our local congregation, as many other Messianic congregations across the country, will fast with the nation and gather to pray. I will be praying for eyes to be opened, for God to reveal the Jewish Face of His Son to His people, even as they read ancient prayers. I will pray that words will pop out of the prayer book and be filled with true meaning. And that the fast and long prayers will not satisfy their need to be rid of their guilt, that they will look for the Real Thing! Dana immigrated to Israel from Latvia eight years ago, and married a good friend of mine. In her homeland she was working as a lawyer for the central bank. In Israel she wanted to seek a different path for fulfillment. A few years ago she attended a couple of our seminars and Tabernacle workshops, and diligently applied the teaching. Her life was impacted in many ways, to the point she even started coaching others via Skype, and with much success. Ever since I heard Orna’s teaching about building a Tabernacle in our hearts, I became a “fan” of it. I love to apply it in my own life and share it with others. And I especially love the work that we all need to do at the Brazen Altar – meaning, repentance and forgiveness. Once I applied it and realized the quick and deep transformation it brings into my life, I made it a part of my routine. It became my main way of dealing with any struggle or hardship. My husband and I run a small family tourism business. Two weeks before Orna and I left for Finland, a new customer contacted us. We communicated mostly through emails, but almost from the get go I realized that she evokes many painful feelings within me. I felt that she was extremely demanding and manipulative, and it made me anxious and distressed. I would turn my computer on, and my abdominal muscles would tighten up. There were days that this client was all I could think of. It deteriorated to the point I could not sleep or eat properly. I started questioning if I will be able to minister in Finland and assist Orna. “Why did it need to happen now?” I wondered with much frustration. We left a humid, crazily hot and dusty weather (Israeli summer), and could not get enough of the green view and refreshing air. While the locals were heating up their homes, Orna and I opened all the windows we could. I was constantly reminded of my childhood in Latvia, so every berry bush and booth in the market made me jump with joy. I devoured the colorful variety of wild berries, while Orna looked at me, tasted one once in a while and in most cases sealed the case with a specific expression and two plain words – “too sour”. We were invited to teach in various places about the role of Gentiles alongside Israel in this time in history. In two places we also held long seminars, and taught about healing of wounds through the Tabernacle. The Finish people are calm, quiet and sweet. Their facial expressions don’t always show many emotions, so at times we could not figure out what they think about our teaching and if they are practicing it. Gradually we saw God working in many hearts as they were applying the teaching and choosing to repent, forgive and agree with what the Word says. We saw quiet tears, touched hearts and hope restored. Some of them dealt with deep childhood memories that were never touched by the Light of God. Others worked on current hurts, inflicted sometimes even by loved ones. We saw immediate results in their facial expression and in some cases, even in circumstances, once they chose to open some locked doors and let Yeshua into the pain. One morning we discussed what we should do when we hold anything against God. One elderly lady gently commented that He is all good and loving, therefore we have no right to hold anything against Him. Right. However, we still do. A minute later she suddenly broke up, while Orna was teaching, put her pen aside, fanned her suite’s flaps and cried out, “Oh… no… I just realized how angry I am at God. Sooo angry!” Then she sat down calmly and smiled. She realized how much she was holding against God, and that she had to do something about it in order to walk in freedom. The Tabernacle provided her the means and Biblical basis to do exactly that. Our internet connection throughout our time away was somewhat problematic, which made me quite happy. That meant: no real ability to check emails, and time off from the stressful communication with the client. But God kept knocking on various doors inside me. I was still stressed, and my stomach was still in knots. Finally I said, “o.k., Lord. I hear your knocks”. While Orna was teaching about forgiveness, I decided to finally apply. I invited Yeshua into the facts that troubled me, the feelings and thoughts it brought up and also into my physical and emotional reactions. Almost immediately the Holy Spirit reminded me of a traumatic childhood incident. A teacher in kindergarten had shamed me terribly and abusively, in front of all the other kids. The feelings I had back than were similar to the ones invoked by the communications with this customer. Once I chose to forgive the client, God immediately went deeper and touched a deepest wound. I moved on in the healing process and faced the Menorah (which represents God’s Light, searching our innermost being). I realized that deep inside I don’t feel that I have control over my life, that even God is not in full control. I had a sobering moment when I understood that my fear is the one in control. “Commit your way unto the Lord. Trust also in Him and He shall bring it to pass. And He shall bring forth your righteousness as the light and your judgment as the noonday” (Psalm 37:5). I started “eating” this portion, speaking it to myself and taking it into my innermost being, especially when the painful feelings popped up. As the tour continued I had several opportunities to share this story with the audience. I had a fresh testimony, still in the making. My heart was still tender and sometimes even in pain, but it was obvious that forgiveness works. So my battle turned into an invitation for our audience to walk through the Tabernacle themselves. I was in awe when I saw how God had prepared this trip from the beginning to the end. He used my new customer to heal a deep wound I totally forgot about. I finally realized He chose the best timing for me. What seemed to be a redundant stress turned into an encouragement for others – to run for forgiveness and build a Tabernacle in their lives from the very crooked and broken areas. Would you like to do it yourself? Would you like to see God’s glory taking over the very broken areas in your life, changing a painful and broken area for good? It is possible and simpler than you may think. But it involves a process. The pattern of the Tabernacle explains how God wants us to do that (our book Woven With Gold describes this process in detail. It is available for purchase in Hebrew, and hopefully will also be available in English early next year. For a detailed look into the topic of forgiveness, we offer a booklet called Who is knocking on your door? (A Study Guide to accompany this booklet will be available for purchase after October 2017). I am working on a new program, designed for English speakers. Each participant will choose a broken area in his or her life, and walk with it all the way to the Holy of Hollies, where provision, peace and victory await us. You are invited to visit Israel and join us for an intense “walk through the Tabernacle” workshop. It will last 8-10 days and will take place in April 2018 (dates are not final yet). If you are interested, email me, and I will send you prices and further details.